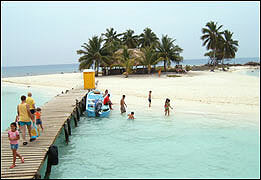 Goff’s Caye is a small island located a stone’s throw away from Belize City . Only a 45 minute boat ride away, this lovely coral island sits on top of Belize ‘s Great Barrier Reef . Surrounding the island, pristine waters change to varying colors of blue depending on how the sun hits the surface. The waters are teeming with a myriad of colorful, tropical fish and the reef is loaded with a variety of colorful corals. A formal narration about the island and surrounding environment will take place subsequent to the voyage. Before leaving for the island, you will also be fitted for your snorkel gear. Along the way, our trained crew is happy to answer any question you may have. Upon reaching the island, you will have 30 minutes to explore the northern end of the reef. Once this is over, you will be taken to the island for some beach combing and relaxation. When you have rested sufficiently, the guides will then take you to the southern end of the island, where your exploration of the reef will continue. Throughout the tour, our guides will happily offer any guidance or assistance that you may need. Get lost in the beauty of Goff’s Caye for a memorable experience!! Please wear your swimsuit and bring a towel, sunscreen, a straw or baseball hat, and an extra t-shirt. You may want a waterproof camera as well. All snorkel gear will be provided. Looking for a relaxing, yet fun time while on vacation in Belize? Well here are some good ideas courtesy Guerrero's Charters! We offer a selection of One-Day Trips that everyone in your group or family will most certainly enjoy. Our trips range from River Wildlife Adventures to Reef Snorkeling or Reef Fishing to Island Hopping.